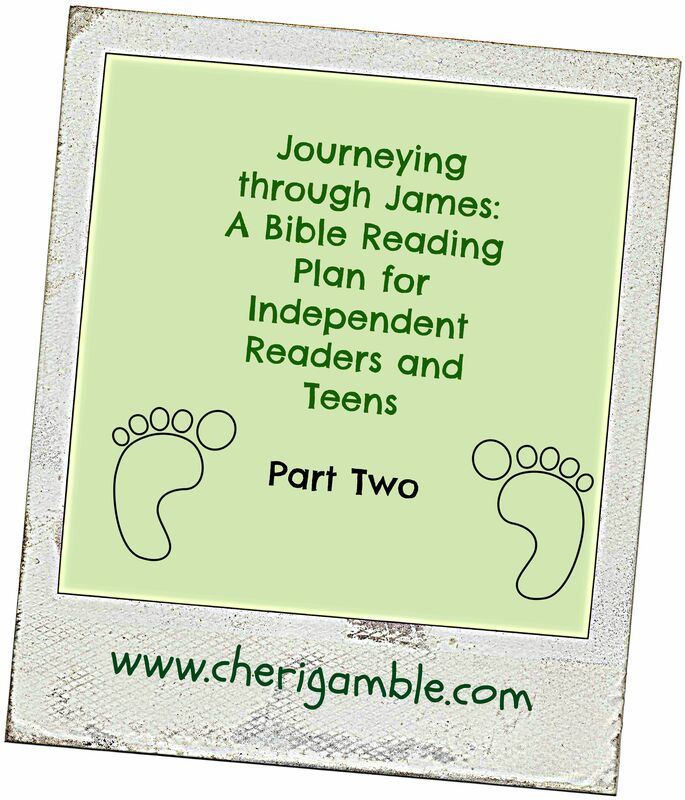 This is a Bible reading plan for Independent readers and teens over James Chapter Two. It includes 8 weeks of Scripture, application questions, prayer and outreach ideas and more! Welcome to Part Two of Journeying through James for older children and teens! We are continuing our Bible reading right where we left off . . . on James Chapter 2. This plan is 8 weeks long and contains suggested Scripture, application questions, prayer and outreach ideas, and videos to help your child grow closer to Jesus and learn God’s Word. If you are new here, you might want to start your child with James Chapter One. If you have younger children or children who prefer hands-on activities such as crafts and snacks, you can find a plan for them here. Also, this Bible reading plan is based on The Book of James: A Hands-on Homeschool Curriculum. If you homeschool your children and you want a deeper study, check it out for a more intense yet fun hands-on and highly applicable study. There is also a special group study that goes along with these readings. This is perfect for families who want a deeper once-a-week fun family Bible time or for children’s workers who are ministering to children in a group setting. I am writing this curriculum for use with the children’s ministry at the church where my husband and I serve. It is what we will be using for our after school program this year and it contains ideas for games, detailed lesson times with life applications, and additional activities that include craft and snack ideas. I am making this available for you to use with your family or church and you can download it as a pdf here. If this sounds interesting to you, but you want to see what a lesson is like first, you can find a sample lesson here. And now, here is Journeying through James: Part Two! ___ Day One: James 2:1-4. Think about it: Why is it not good to show favoritism? Do people show favoritism today? Do you ever show favoritism? Pray about it: Ask God to give you a love for ALL people! ___ Day Two: Genesis 37:1-4. Think about it: How did Jacob (Israel) feel about Joseph? How did he show this? We are not going to read about it today, but do you know what came about as a result of the favoritism Jacob showed his son? How can you make sure that you are not showing favoritism in your life? Pray about it: Ask God to help you notice when you might be showing favoritism and to show you ways to avoid it. ___ Day Three: Acts 10. Think about it: What does this passage teach us about showing favoritism? What does the fact that God does not show favoritism mean to you? Pray about it: Spend time today thanking God for the fact that He does not show favoritism. ___ Day Four: Romans 10:11-15. Think about it: What do these verses say about showing favoritism? According to these verses, why should we not show favoritism? Pray about it: Ask God to help you have the courage to take the gospel message to everyone – even people who are different than you. ___ Day Five: James 2:1-4. Bake a dozen animal cookies and take them to a neighbor who needs to know about Jesus. Invite the neighbor to church! ___ Day One: James 2:5-7. Think about it: Can you think of any examples from Scripture of God using the poor to serve Him? What do you think it means to be rich in faith? How can you be rich in faith? Pray about it: Ask God to help you be “rich in faith”. ___ Day Two: Exodus 1:1-14, Exodus 2:1-10. In James 2:5-7, James was telling the church that the rich were oppressing them. The rich were taking advantage of them and using them to fulfill their wishes. This happened in the passage of Scripture you read today, too, but in the middle of all of this, a little baby was born in a poor family who would eventually deliver the people. This is a reminder that God can use ANYONE, rich or poor, to serve Him. How do you think God can use YOU? Pray about it: Ask God to show you ways that YOU can serve Him today. ___ Day Three: Luke 16:19-31. Think about it: Compare and contrast the life of the rich man and Lazarus both before they died and after they died. How do you think these verses relate to James 2:5-7? Pray about it: Ask God to help you remember that life is not about money, it is about knowing Jesus! Here is a video our family made after we studied this passage together. Enjoy! ___ Day Four: Proverbs 19:17, 1 John 3:17-18, Proverbs 21:13, Galatians 6:2, Proverbs 28:27, Deuteronomy 15:11. Think about it: Those were a lot of verses today! What do they all have to do with James 2:5-7? Pray about it: Ask God to help you develop the right attitude about money! ___ Day Five: James 2:5-7. Come up with a plan to help the poor! Do it! Note: The entire 5 day lesson for this week is available for free here! ___ Day One: James 2:8-10. Think about it: What do you think it looks like to “Love your neighbor as yourself”? When we show favoritism, are we truly loving our neighbors? Pray about it: Ask God to show you ways to specifically love those around you this week. ___ Day Two: Exodus 20:1-17. Think about it: All these laws can basically be summarized in two principles: love God and love others. How are you doing at loving God and loving others? How can you practically share your love with others today? Pray about it: Ask God to increase your love for Him and for others. ___ Day Three: Luke 10:25-37. Think about it: How do these verses relate to James 2:8-10? How do these verses reenforce that we should not show favoritism? Pray about it: Ask God to help you love ALL people. ___ Day Four: Galatians 3:23-29. Think about it: What held us prisoner before Jesus came? Who has rescued us from the law and made us possible to be saved? How does Galatians 3:28 relate to James 2:8-10? Pray about it: Thank God for His gift of grace and ask Him to help you love ALL people. NOTE: We are all one in Christ. Showing partiality of favoritism makes absolutely no sense for a Christian! Jesus died for ALL people and we need to love ALL people, too! ___ Day Five: James 2:8-10. Be the Good Samaritan this week. Look for ways to go out of your way to help someone else – especially someone else you might not normally think of helping. ___ Day One: James 2:11-13. Think about it: How are we to speak and act? How do you think we can do that? Have you ever experienced mercy? Pray about it: Spend time today thanking God for His great mercy towards us! ___ Day Two: 2 Samuel 11. Think about it: This can be a tough passage of Scripture to read! In this passage, we see King David commit both of the sins mentioned in James 2:11-13. At the end of this passage, it looks like David got away with both of those sins . . . but did he? No! Not much longer after this happened, God sent the prophet Nathan to confront him and his sin. The baby born to Bathsheba and David died, and David’s family, and eventually the nation, fell apart. Sin ALWAYS has consequences . . . but aren’t you glad that we serve a God who shows mercy? God loves us and forgives us when we sin! Pray about it: Confess any sins that you may have committed and then thank God once again for His great mercy to you! ___ Day Three: John 8:1-11. Think about it: Who was shown mercy in this passage? What did Jesus tell the woman to do? NOTE: It is important to realize that Jesus told the woman to go and sin no more. He did not condemn her in her sin, yet He also did not leave her in her sin. He called sin exactly what it was – sin – and told her to stop it! Are there any sins that you need to stop today? Pray about it: Ask God to help you recognize sin as sin and to stop those sins that you might be holding onto. ___ Day Four: Luke 6:27-37, Matthew 5:7, Matthew 9:9-13, Colossians 3:12-13. Think about it: What do these verses tell us about mercy? What are some ways that you can show mercy? Pray about it: Ask God to help you show mercy to the people around you. ___ Day Five: James 2:11-13. Gather a few rocks and decorate them to remind you of God’s mercy. Keep one of these rocks with you to remind you to show mercy to others! ___ Day One: James 2:14-17. Think about it: How are faith and works connected? Are you ever in danger of having faith but no works? Pray about it: Ask God to show you how to put your faith into action. ___ Day Two: Genesis 6:5-22. Think about it: How did Noah put his faith into action? Do you ever have situations where you know you need to obey God but the task seems very difficult? How do you respond in those situations? Pray about it: Ask God to help you obey Him – even on those difficult tasks! ___ Day Four: Spend your day today coming up with a plan of action of something you are going to DO for the kingdom of God! You could clean up your neighborhood, visit all the local parks and clean them up, take meals to homeless people, sort through your belongings and select some to give away, volunteer at a local community service organization or find someone who could use extra help. Today you will make your plan, tomorrow you will carry it out! ___ Day Five: James 2:14-17. Carry out the plan you made yesterday! A great song for this week: What acts of love are you doing? ___ Day One: James 2:18-19. Think about it: What do you think is the most important – faith or works? Why? Do your actions point to God or point away from God? Pray about it: Ask God to help your actions point to Him. ___ Day Three: Mark 5:1-20. Think about it: What problem did the man in today’s passage have? How did Jesus solve that problem? How do you think this relates to James 2:18-19? NOTE: From this passage, we can see that the demons knew who Jesus was. They knew that Jesus had power over them, and they were afraid of that power. This is exactly what James 2:19 is talking about! Today, Satan and his demons still know who Jesus is, and they want to keep everyone they can from following Him. Pray about it: Ask God to help you reach out to the people around you who do not know Jesus. ___ Day Four: Hebrews 11. Think about it: This passage is often referred to as the Hall of Faith. It is a great chapter telling about great men and women of God who had great faith! But was faith all they had? No! They all DID SOMETHING about their faith – they put their faith into action. What are some of the ways the people in this chapter put their faith into action? Pray about it: Ask God to make you a person who always puts his faith into action! ___ Day Five: James 2:18-19. Think of another way to put your faith into action and do it today. 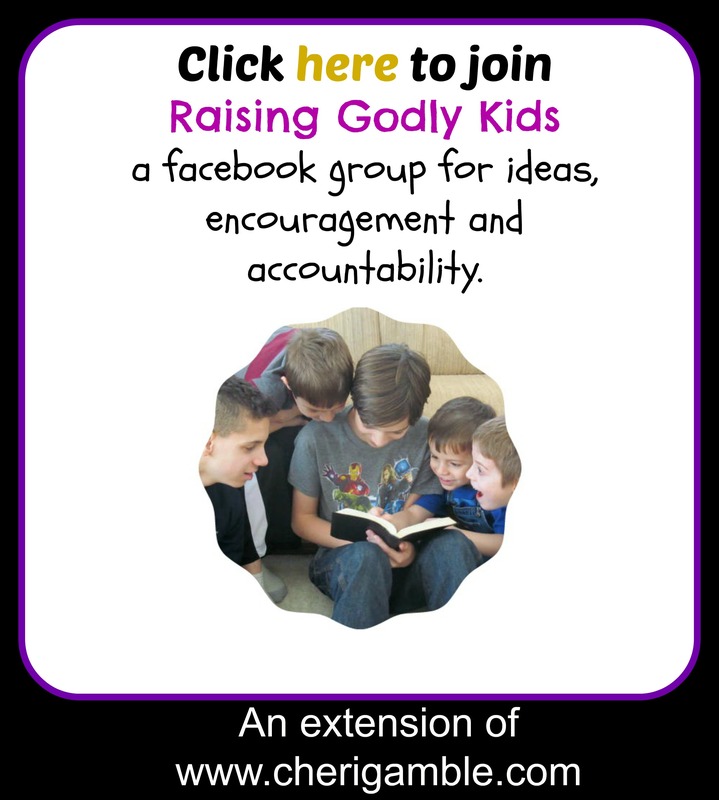 It would be great if you could take pictures of the ways you are putting your faith into action and have your parents share the pictures at the facebook group that goes along with this study as a way to encourage others to put their faith into action, too! ___ Day Two: Genesis 22:1-19. Think about it: What did God tell Abraham to do? What was Abraham’s response? What can this passage teach you about putting your faith into action? Pray about it: Ask God to help you be obedient even when you can’t see the whole picture. ___ Day Three: Acts 9:1-19. Think about it: How did Ananias put his faith into action? Does God ever ask people to do things that are risky or dangerous today? What do you think your reaction would be if God asked you to do something dangerous? Pray about it: Ask God to give you courage to obey Him NO MATTER WHAT! ___ Day Four: Matthew 28:18-20. Think about it: Does this command apply to us today? Have you been living out these verses in your own life? Pray about it: Ask God to help you to GO to everyone He sends you to and tell them about Jesus. ___ Day Five: James 2:20-23. Make a painting to illustrate our responsibility of taking the gospel to the whole world . . . then walk across the street and share the love of Christ with a neighbor! A song for this week – GO! Obey God, even if it is dangerous! ___ Day One: James 2:24-26. Think about it: Who had faith in these verses and how did she show her faith? What does it mean that faith without works is dead? Pray about it: Ask God to give you a LIVING faith . . . shown by your good works! ___ Day Two: Joshua 2. Think about it: There are really two ways that Rahab put her faith into action – she hid the spies, and she placed the scarlet rope in her window like the spies told her to. Do you think it was easy for Rahab to take these steps? How were her actions dangerous to her? Pray about it: Ask God to help you put your faith into action – even if it is dangerous! ___ Day Three: Mark 7:24-30, Matthew 8:5-13, Matthew 14:22-33. Think about it: How did all the people in these verses put their faith into action? How can YOU put your faith into action? Pray about it: Ask God to help you know how to put your faith into action every day. ___ Day Four: Ephesians 2:8-10. Think about it: How would you explain the relationship between faith and works? NOTE: While it is important that we put our faith into action, we must be careful that we always remember that those actions in and of themselves do not save us. We are saved through Jesus. No amount of good works can make us a Christian. However, when we become a Christian, we automatically want to do good works to glorify Jesus. Pray about it: Ask God to show you the ways that He has created you to be a masterpiece! ___ Day Five: James 2:4-26. Rahab lived on the wall in Jericho and she let the spies out through her window. Help wash walls or windows this week . . . or use window crayons or paint to decorate a window and point to Jesus! When you finish this Bible Reading Plan, be sure to continue on to James Chapter Three!